My my, have you seen all that snow on the East coast of the US?! Luckily we just had the wind and rain from that storm but my thoughts definitely go out to all the people who are stuck in their homes for a while! It’s turned really cold for us this week though…I’ve even had to put the heating on! I finally feel like we are back to our normal routine this week, and I’ve actually managed to get quite a bit done around the house & with ongoing projects too. Here are my seven photographs from this week – mainly doggy photos! 1/2. Maisy and Buzz have started to be even closer to each other this week. 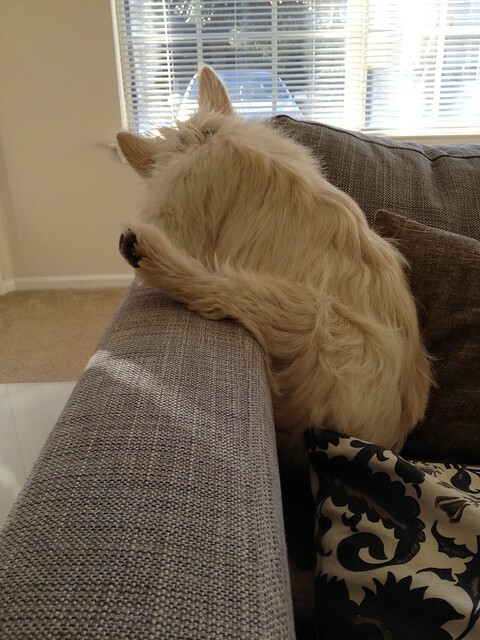 Buzz really made me giggle with the way he was laying on the sofa so I had to take a photo! 3. This week we had to go for our physical exams to get the all clear to accompany our Green Card applications. Making any kind of appointment is hard to schedule with Adam so we had to get up one morning to set off at 7am and then another day I had to pick him up from work, which is an hour away! 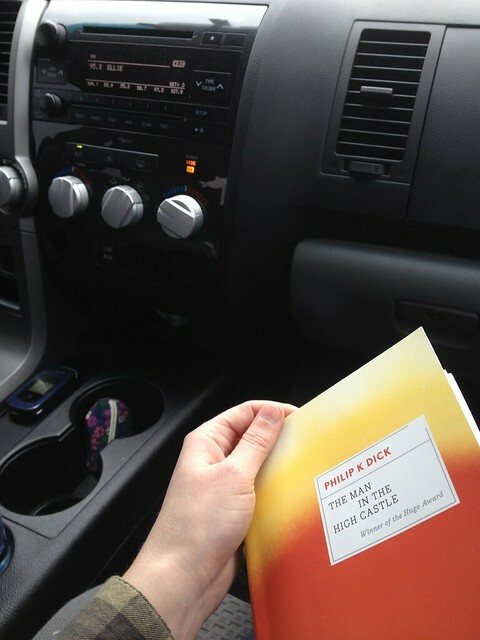 Anyway, I spent quite a lot of time reading a new book in the truck! The physical exams were not what I was expecting as we each had to have 4 vaccinations and blood drawn! I felt sorry for myself all day on Wednesday! 4. The puppies were great at making me feel better! 5. I’m finding it very interesting to watch how different each dog is. Maisy has never really been a lapdog apart from when she wants to be cuddled. Whereas Buzz can not wait to jump on a lap and be cuddled. He really doesn’t leave my side! 6. 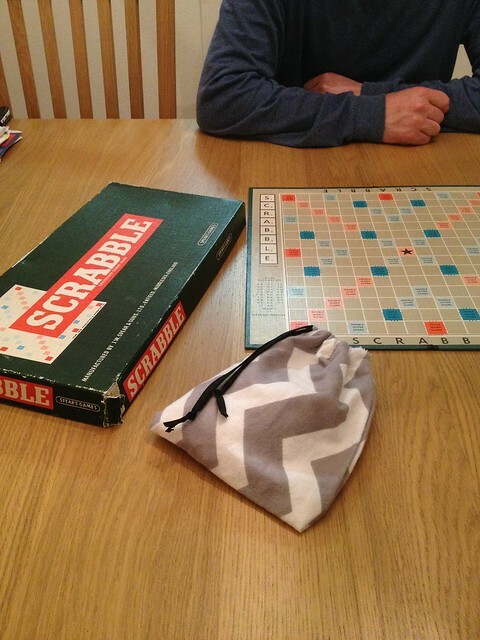 We had a quick game of Scrabble on Friday. This version came across with our belongings when we shipped everything over…I have absolutely no idea where it has come from though! The Scrabble I had was a new version and this one we seem to have acquired is dated 1955! I used one of the bags Abi sent me in my #stitchingsanta for the tiles! Glad you managed to avoid the worst of the storm. The pictures of Washington we saw on the news are crazy! Our cat sits just like that on the back of the sofa, amazing they can balance! I know! It’s crazy how much snow has fallen! I’m glad we just got the rain! I wonder what it is with the sofas that pets like?! I’m really pleased that I got it finished 🙂 I felt bad that it had just been laying around for a week! Where are you in relation to Washington? My US geography could be better. 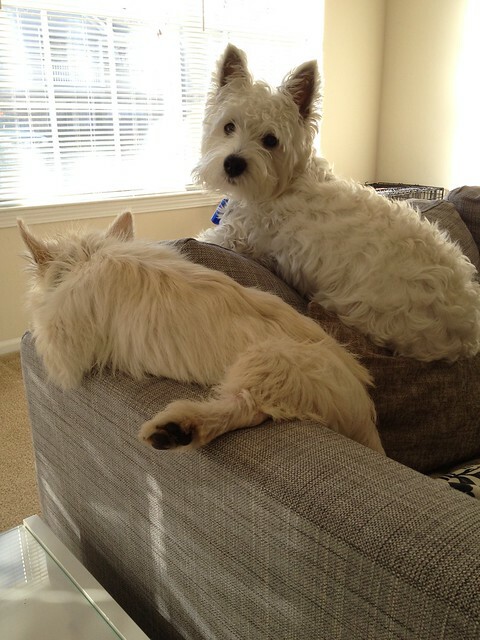 My two dogs also perch on top of the sofas like that. It must be a small dog thing as they have a good vantage point up there and probably feel safer, too. 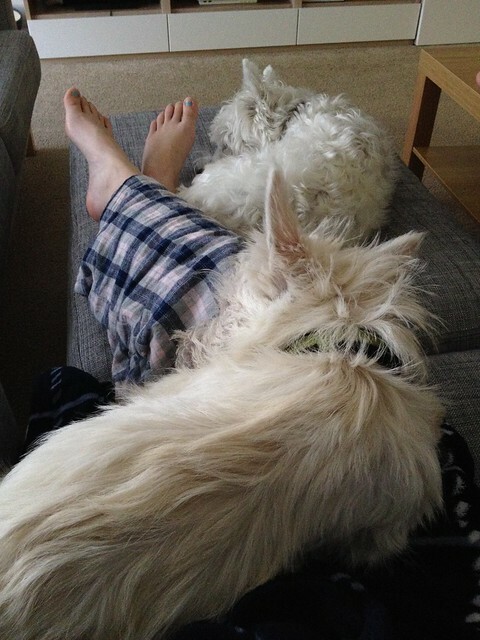 Mine are also lap dogs and, quite literally, stand there staring at me until I sit down in the evenings, pull a crochet blanket over me and then they leap up like lightening to curl up on my lap! It is really nice having a lap dog, especially as they nuzzle in for more cuddles! Wow, it’s only a 2 1/2 hour flight to my Auntie’s in Southern Spain – and that’s a foreign country!! You’re lucky about the snow! We have none. I’m glad to hear you used the bags! Maisy and Buzz are SO adorable. Maisy and Buzz. What a duo they are, and Buzz looks like he’s ready to go either down in the ditch or over the edge at any second! So funny. Glad you escaped any damage from the storm, it was a doozy. Exam day sounds like it was no fun at all. 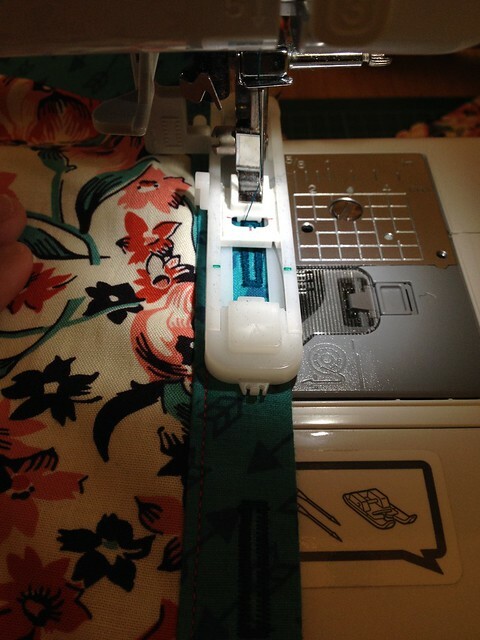 Looking forward to the dress reveal, the button placket looks quite fabulous! 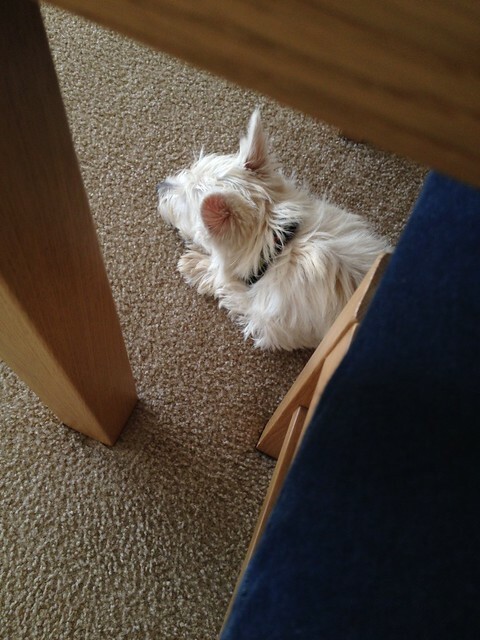 Does Maisy realise Buzz is taking over as the star of your blog? Sorry to hear about the vaccinations – what the heck were they for?